Most faces are asymmetric, the nose rarely straight, the eyes rarely on equal highs. Most muscles of the face present rather by their effects than by themselves and nearly all are involved in its mimic expressions. The superficial muscle of the face are all interconnected and many of their fibers spread out into the skin. To lift the eye brows or to create or deepen the folds of the front is made possible by the frontal muscle. It takes its origin from various sites above the orbit of the eye, covers the front and is attached to the occiput by an aponeurosis under-passing the entire scalp. 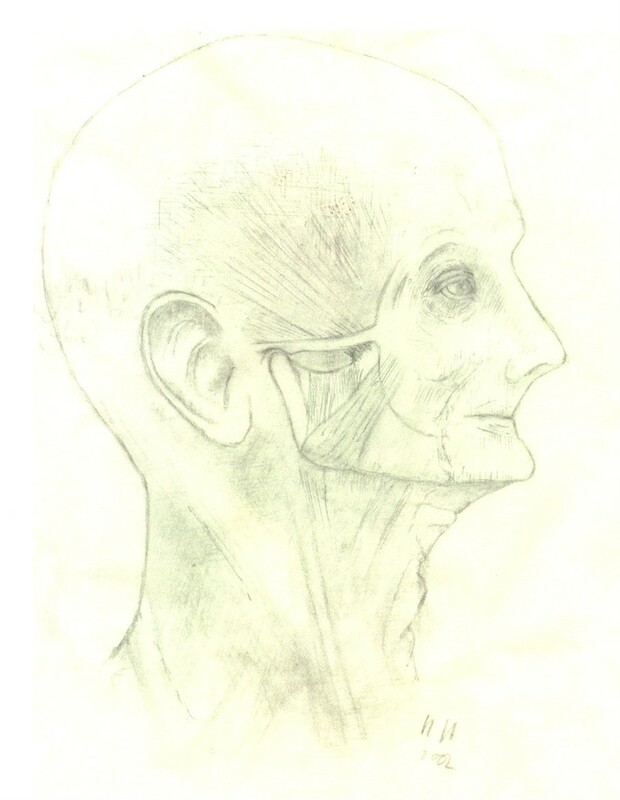 Age related atrophy of the mandible, of the tissue covering the chin, of the masseter and the loss of teeth, contribute all - together with the changes involving eye and orbit- to the expression of sharp bitterness, frequently characterizing the faces of elderly people.